From a bit of a global online trading pariah in 2015, FXGiants have turned their operation around completely these days, offering their clients and would-be clients a very reasonable, regulated trading package, which grants them access to some of the newest and most popular financial products, such as bitcoin and bitcoin-based CFDs. Why exactly do we consider FXGiants a good pick these days though and why should you choose to trade the markets with them? To start at the beginning: they offer a massive range of trading instruments. They feature more than 200 tradable assets, grouped into 6 different classes. The leverage they offer is very flexible: it covers the range from 1:1, all the way to a mind-boggling 1:1,000. It has to be noted that the available leverage depends quite a bit on the account-type one opts for, upon registration. The brokerage offers a free practice account. This is a sort of demo, which lets traders get acquainted with the trading platforms of the operator, while putting their trading strategies to the test, without risking a single cent of real money. The base-currencies for the various account types cover an impressive range as well. Besides majors like the USD, EUR, JPY, AUD, GBP and CHF, FXGiants also support PLN, CZK and HUF. The brokerage plays host to a variety of attractive promotions, among them trading competitions for live and demo account holders. There truly is no better way to add another intriguing dimension to the trading game, than allowing traders to let their results do the bragging for them. FXGiants’ IB commissions are very attractive and the program based on these commissions is in large part responsible for the recent revitalization of their trader-base. In addition to the myriad of trading services they offer, FXGiants also provide live rates for the most popular currency pairs. Education is the bread and butter of the successful trader, and FXGiants have their users covered from this angle as well. Their Education section delivers daily market reaction reports and economic news, together with an Economic Calendar and a Forex Glossary. As said above, a major part of FXGiants’ newfound appeal stems from the fact that the operation is licensed by the UK’s FCA. The company which represents the FXGiants brand in the UK, is 8Safe UK Ltd, and it is indeed the possessor of FCA license #585561. In addition to that, the brokerage also has an ASIC license (#417482). FXGiants do not accept traders from the US and a number of other countries like Iran, Cuba, Syria and North Korea. FXGiants’ regulatory umbrella obviously does not extend to the US. The operator keeps its funds with high profile banks such as BofA and Deutsche Bank, and client monies are held in segregated accounts. FXGiants is a member of the Financial Services Compensation Scheme, and as such, its clients’ deposits are protected to the tune of £1 million (due to the Excess of FSCS Insurance 8Safe UK Ltd have purchased). In addition to the above mentioned trading competitions, FXGiants offer a number of bonuses as well as a free VPS deal, to those who qualify. The Limited Covered Trades Bonus compensates traders for the losses incurred over their first five trades, up to $500. The deal is only valid for Live Floating Spread Accounts and the money awarded as compensation is considered bonus money, which means it cannot be withdrawn. The 100% Bonus Maximizer matches trader deposits 100%, without an upper limit. While the offer is indeed rather unique, the money is still bonus money, and as such, it cannot be withdrawn. Traders are free to withdraw the profits they manage to generate with the help of the bonus money. 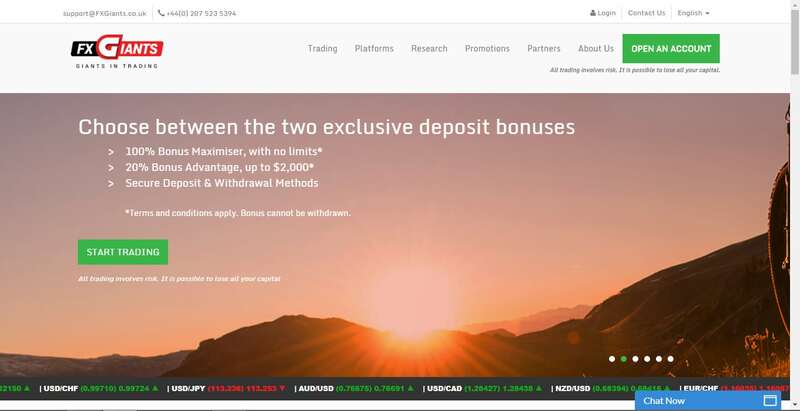 The 20% Bonus Advantage deal matches trader deposits up to a maximum of $2,000. The deal is valid for all deposits. The bonus money cannot be withdrawn. The free VPS service complements the EAs delivered by the MT4 platform wonderfully. To benefit from the deal, traders are required to make deposits of at least $5,000. In addition to that, they need to generate a monthly trading volume of at least 5 lots and they need to maintain a $5,000 balance for some time. Those who do not qualify for the deal, can still choose to simply pay for the VPS service: its cost is just $30, and for someone into EA-based trading, it is well worth it. Forex products constitute the backbone of FXGiants’ product offer. A massive number of currency pairs are available in this category, and the spreads cover an impressively wide range as well. Naturally, the more exotic the pair is, the larger spread it will feature. For the USD/JPY pair for instance, the minimum spread is just 0.4 pips. It bears repeating though that spread-levels depend on the type of account one chooses too, not just on the traded currency pair. On the GBP/ZAR pair on the other hand, the minimum spread is 300 pips. The Spot Metals category covers gold- and silver-based CFDs. Supposedly, the spreads on these are among the best too. Indeed, the minimum possible spread on the XAG/EUR for instance, is just 0.04 pips. The Spot Indices and Commodities section is one of the more interesting product categories, by virtue of the fact that BTC is included here. By placing it next to Natural Gas, Brent and WTI, FXGiants effectively classify bitcoin as a commodity. The spreads on BTC are massive though as are the margin requirements, so it’s not really a financially sound option after all. The Futures section comes with much better spreads though. On the CHF futures for instance, the minimum spread is just 0.0002 pips. The same pretty much goes for Shares. The trading conditions on this category are excellent. The minimum spread is just 0.03 pips, and the commission is 0.10%. The used margin is 10%. As said above, FXGiants’ platform selection is made up of different MT4 variants. These MT4 versions cover PCs, Macs, as well as various Android- and iOS-based mobile devices. They all deliver though when it comes to advanced charting features, technical analysis and Expert Advisors. The top-tier platform is obviously the Advanced version for PC, where all the above mentioned features are present and much more. To accommodate every possible need, FXGiants have created no fewer than 7 account types. The base account is obviously the Micro, which only requires a $100 deposit. The Premium account is the most expensive, featuring a minimum deposit of $2,500. Most of the other accounts require $500 deposits. [email protected] is the official email through which the support staff can be contacted. There is an email form available at the site too, as well as a wide selection of regional, toll-free numbers for several countries. FXGiants do indeed look like they have gotten their act together. Their platform selection is impressive, as are their best trading conditions. They have jumped aboard the bitcoin CFD train, and they feature a massive selection of tradable assets. Their VPS offer is truly the cherry on top of the cake.